Earlier this month I had the chance to spend an entire Saturday sewing with my mom and sister, the first time the three of us had sewn together. A group of local crafters get together each year in the basement of one of the local churches for an all day event: 8 am - 9 pm. This year was our first year attending; we had a great time. There was lots of room, which allowed us to have a really nice set-up. 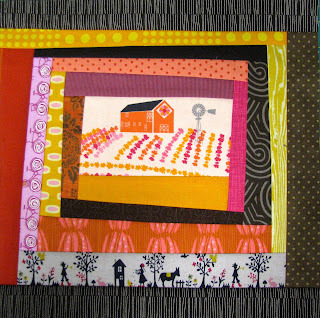 The three of us put our machines together at one table, then had the ironing board next to us against the wall, as well as a couple tables next to us to spread out on - one long rectangular table with my large cutting mat and then a couple round tables for piling fabrics and blocks. The kitchen is in the back of the picture above. I meant to take a picture as the event was pot-luck and there were crock pots plugged in to every available outlet. Plenty of food to keep us fueled for the day! That last picture also shows my fabrics neatly laid out on one half of the table - by the end of the night I had used nearly all of them and they were nowhere near this organized! In addition to helping my sister with her project, I spent the day working on wonky log cabin blocks. I am piecing them on a muslin foundation - each one takes FOREVER! This could partly just be me as I am not a grab-and-go sewer; I tend to think for a while before settling on which fabric to use next. By the end of the night I only had three new blocks done; they started out as 8", 9" and 12" blocks. The 9" block ended up getting cut off to be rectangular. I was SO happy with how they turned out! 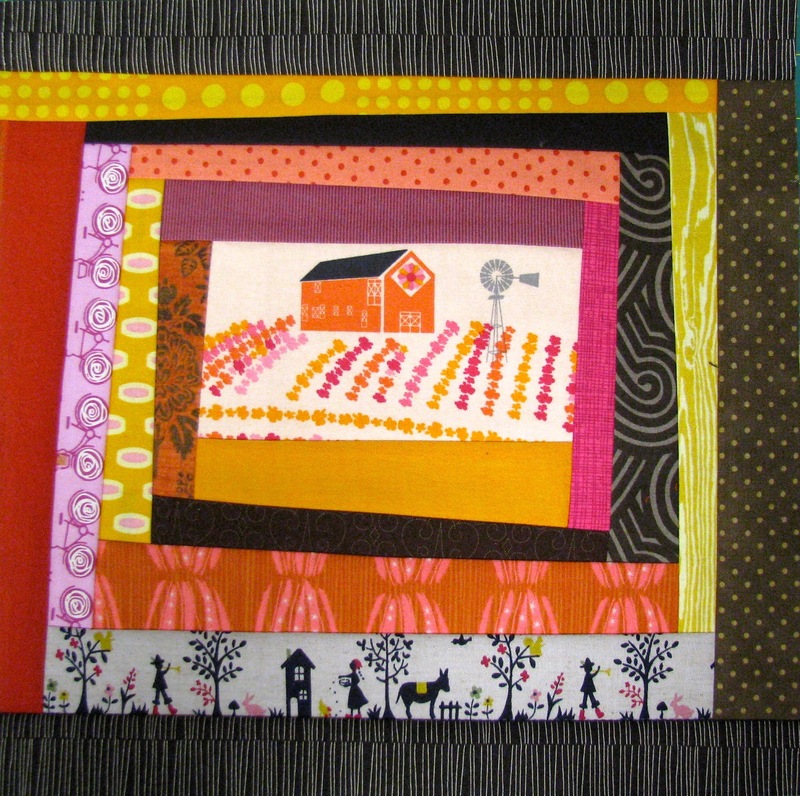 The block on the left above is the first block I had made for this quilt, in Fall 2011. 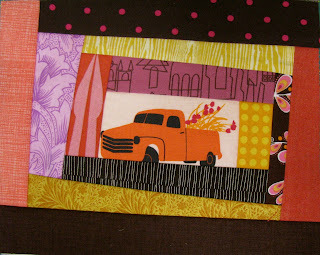 For that block I had used an Anna Maria Horner Good Folks fabric, fussy cut, for the center flower. The three on the right are the new blocks, and I used fussy cut pieces of a Madrona Road print. I have been wanting to work on this project again for months and was glad to fit in some time for it. I ended up liking these so much I'm seriously considering framing them. They don't really go with our decor, but I might put them up anyway. It's going to take me quite a while to finish the quilt and I don't like to think of them sitting in a box for so long... 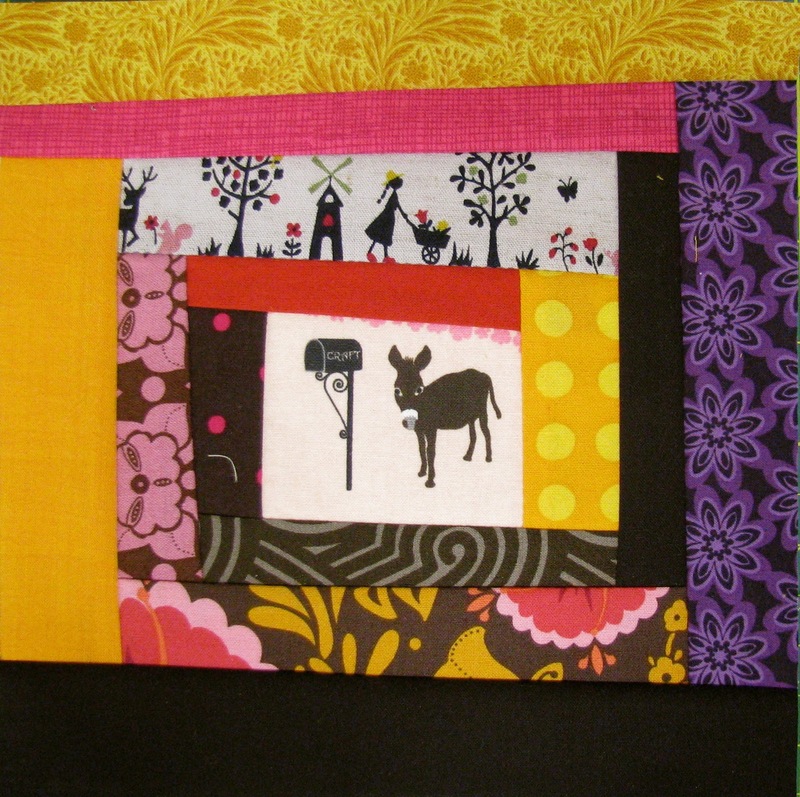 I'm adding bits of embroidery to each of the log cabin blocks in this quilt; I haven't done that on these yet. You can see a close-up of the embroidery on the original block here. In addition to sewing it was fun to walk around the room throughout the day and see what some of the other ladies were up to. This lovely quilt was pieced using vintage pieces from a family member's stash of fabric. All in all a fun day, and it was great that it was only a few minutes from home. Next year I want to remember to either bring some kind of mat to stand on, or bring a project where I'm sitting at the sewing machine most of the day. This year I spent lots of time standing, bent over the cutting table and my back and feet were definitely aching by the end of the day!